[Mme. Szumowska was born in Lublin, near Warsaw, her father, a college professor, having settled there on his return from Siberia, where he had been sent as a political exile in 1863. She was educated at the college in Warsaw, from which she was graduated with high honors. She had studied music as a child, but did not begin seriously the study of the pianoforte until after her graduation from college. She then became a pupil of Professor Strobl at the Conservatory in Warsaw, and also Alexander Michalowski. In 1890 she went to Paris, and there attracted the attention of Paderewski. who was so impressed with her musical gifts that he offered to become her teacher, and for five years Mme. Szumowska enjoyed the advantages of the instruction and advice of the great Polish pianist. After being under his training one year she began to play in public, making a successful debut at the Salle Erard, Paris, 1801. 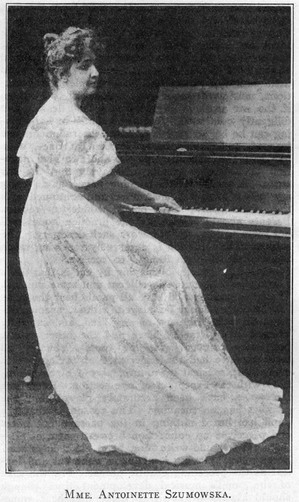 The following year she played in London in Henschel’s Symphony Concerts, at the Saturday Populars, the Crystal Palace Orchestral Concerts, and in a series of recitals at St. James Hall. In 1893 she made a concert tour of the English provinces, and also played in Warsaw, Keiff, and Lemberg. She paid her first visit to America in 1895, when she appeared with the Boston Symphony Orchestra in Boston and in New York, and with the Thomas and Damrosch orchestras in various cities. In September, 1896. Mme. Szumowska married Mr. Josef Adamowski, the well known ‘cellist. Certainly, Chopin presents a peculiar difficulty on account of his national character, so strongly marked in his works. He is always, in each of his compositions, a Pole. Thus it is almost impossible to come to a full understanding of this matter, unless one has known the Polish popular melodies; unless one has listened to the mournful song of a Polish peasant at his work at the fields, to a lullaby droned by a Polish mother at her baby’s cradle, or seen Mazour danced at a country inn. This explains why, besides the Poles, Chopin is best understood by representatives of other Slavonic races. There is not only the acquaintance with the Polish folk lore—there is also the same streak in the Slavonic and Magyar blood which tells. If one is not related to Chopin by nationality there exists only one power which can raise a bridge across the chasm, and make one understand the great piano poet somewhat better—it is love! A great, deep, almost religious love, will bring one nearer to the spirit of Chopin’s music. A strong feeling of this kind will make us intuitively under stand the wonderful poetry of Chopin’s music, the sad flow of his melody, the intensity of his passionate moods, but above all, it will teach us to comprehend his infinite simplicity. For Chopin is simple—simple as only real greatness can be simple. The mountain tops are simple in the snowy grandeur of their lines. And Chopin’s melodies always flow so simply, so naturally. This is why they generally find their way straight to the human heart, if this heart is warm enough to take them in and vibrate in response. It is there where Chopin’s greatness chiefly lies, in the wealth of his melodies. There is enough melody in the simplest of his nocturnes to feed a whole modern, or, rather, ultra modern symphony, while there is not a daring harmony in the music of this century which may not be traced to one of his mazourkas. His very accompaniment sings; there is an undercurrent of melody running through his counterpoint. This brings me to mentioning the fact that the quality most needed by a pianist who wishes to be a worthy interpreter of the Polish master is the beauty and fullness of tone. One cannot play Chopin without a beautiful singing touch—a dry, harsh one makes his melodies shrivel and wither. While in studying Chopin’s works great attention must be brought not only to the understanding of his ideals, but to the finishing of the smallest details —no trace of this care must appear in the interpretation. One ought to master the technical difficulties, the intricacies of phrasing, the interweaving of themes completely while practicing; the final interpretation must be spontaneous, like an improvisation. Chopin generally improvised his compositions at the piano before he committed them to paper. His nature, though rich and complicated, and even morbid in some of its aspects, had in it the simplicity of a child. One anecdote illustrates it, an anecdote related to me by a French gentleman who knew Chopin during the last years of his life in Paris, and has been a personal witness of the occurrence: Chopin found himself one evening in company of several of his most gifted countrymen, residing at that time in Paris. Among them was the greatest of Polish poets—Adam Mickiewicz. Mickiewicz, while talking to Chopin, began to upbraid him for frequenting too much the society of Parisian plutocracy, and mixing with people unworthy of him intellectually and morally. He said that frequent association with persons below his moral level was tending to lower his ideals, and that it was unworthy of him to cling to this class of people simply because their houses were fine and comfortable, their living luxurious, and because he was feasted and flattered by them. Chopin listened to the harangue, and took it so much to heart that he cried like a child. But suddenly he lifted his head, sat himself at the piano, and began to improvise. He improvised in such a way that it was the turn of Mickiewicz and those others present to cry. There was not a pair of dry eyes in the company, not a heart that did not beat faster, not a pulse which was not quickened. When he finished, Mickiewicz ran up to him, took him in his arms, and …. he scolded no more! Another characteristic of Chopin was his great inherent refinement. There was an unusual distinction in him, which made him shrink from everything which was in a slightest degree coarse or vulgar. This is why his favorite composer was Mozart; he was the only one who never offended his fastidiousness. The sweetness and purity of this radiant soul appealed to Chopin’s sensitive one. Even the great Beethoven, for whom he had, of course, all due admiration and even worship, occasionally jarred on him. Chopin has been described to me by the French contemporary, mentioned above, as a man very exclusive, rather proud and distant, and not easily approached. “C’était un petit monsieur sec, et très distingué,” that was the phrase which impressed me when I heard the description of Chopin, and I remember it vividly after an interval of fifteen years. This refinement and distinction of Chopin’s is a moral trait, which we had better bear in mind when we want to play his music. Altogether there is not, and cannot be, any definite rule for the rendering of his compositions, and it is not easy to give any practical hints to this effect. Chopin is a poet—a representative of the romantic school in the fullest meaning of the word—the poetry of his work must be grasped by instinct, by the poetical intuition of the performer. The polonaise is an imposing, stately dance, very much like the march, except that it is written in 3/4 instead of 4/4. The accent comes on the first beat, the first step of the dance being a long, sweeping one. As to the other compositions, very little can be done in analyzing them; each is a poem in its own right, each a different one, and each must be treated differently. The nocturnes are, for the most part, dreamy in character, and ought to be kept in half lights, but we often find in them stronger and more dramatic passages. The ballades are of a varied character, the composer passes in them through a whole scale of dramatic emotion from sweetness and serenity to a vehement passion. In the Scherzos the composer goes far away from a typical scherzo of Beethoven or Mendelssohn—his scherzo is not a bright, witty jest, but rather the bitter cry of a tormented soul full of passion of despair, with generally a calmer, tranquil interval in a romantic trio. In a short sketch like this, it is not possible to go into details, or each composition would have to be taken up separately. Much may be said of each of them in turn; there are mines of wealth of beauty in each Prelude, Etude, and in larger works like Sonatas and Concertos. Through it all we must picture to ourselves Chopin in his national and racial character, which was very strongly developed, and the understanding of which is a great help in grasping the meaning of his works. Chopin’s nature was essentially Slavonic. Its general tone was one of deep melancholy, and this sort of longing and sadness, for which there is a word in the Polish language having no equivalent in English, the merest translation of it being the German expression: “sehnsucht.” This mood underlies all his works, explaining the great preponderance in them of the minor key. The Slav, with his habitual melancholy, passes from one mood to another with great rapidity, going through a whole scale of emotions, from childish light-heartedness to the depths of passion and despair—and we can follow these changes in many of Chopin’s compositions; we must work ourselves up into corresponding moods of expression while playing. All these characteristics we must contemplate when we attempt the rendition of great works of genius in a very humble spirit, indeed, striving to do our best, by giving a great deal of thought and work and earnest will, and trusting for the rest to that something in nature which brings inspiration to those who pursue their ideal untiringly, though it seem ever so distant. Abstain, and you will not feel the need of any­thing. This word can become of great importance in our life, especially in the present time, in which, more than ever, the chase after the external goods of life is carried on, and in which thousands upon thousands of persons seeking after excessive comfort and luxury for much that is unnecessary and superfluous in life work out their own destruction. One can live freer and more independently when one has learned to ab­stain from the superfluous. From thence comes a gain of time, and also exemption from care; for that from which I can abstain I need have no care. Time is ease, and ease is one of the most magnificent gifts of life, because by it we are placed in a certain condition of freedom.—Ritter. You are reading Antoinette Szumowska - An Appreciation of Chopin from the August, 1910 issue of The Etude Magazine. The Stimulus of a Reward. is the next entry in The Etude.